Share your mobile network insights with the community. We aim to collect and share an open and large-scale dataset of mobile networks for the community and by the community. We encourage you joining us towards a better mobile network research community! You can download the dataset collected by us here. 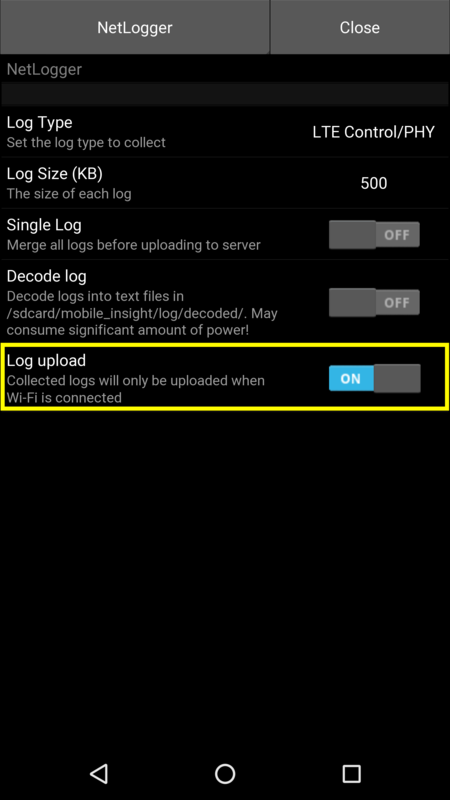 All the logs include message-level cellular network information in the *.mi2log format. You can directly open them using MobileInsight GUI, or perform an offline analysis using these logs. This dataset includes a small set of MobileInsight logs from our full dataset. It includes a sample of user study logs (aggregated by phone model and operator), and some representative logs of problematic usage scenarios. This dataset is collected from 30+ users and 8 US/Chinese network carriers since July 2015. The size was around 250GB uncompressed data (~49GB after compression) as of Jan. 2017. Its size grows over time. We encourage you share the traces collected through MobileInsight and we provide two approaches. You can enable automatic trace uploading in MobileInsight app. To enable it, you can go to MobileInsight->Settings->NetLogger, and check Log upload (as shown below). Traces will be uploaded in the background when you run NetLogger. It only uploades under WiFi and will not consume your mobile data.